The International Awards for Powered Access recognise and celebrate excellence within the Powered Access industry and winners are selected by an independent panel of judges, made-up of our industry leaders, making them some of the most prestigious and respected awards in our industry! As part of the IPAF Summit, this year’s IAPAs were held in Miami, Florida on the 8th of March 2018 and included 13 award categories ranging from new products and innovations to safety and training. 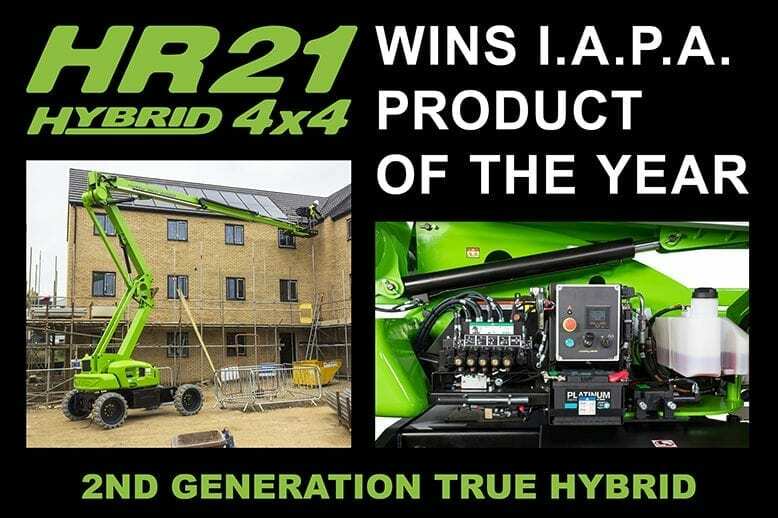 The HR21 4×4 won the ‘Product of the Year – Self Propelled Booms & Atrium Lifts’ category and to do so it had to beat stiff competition from other manufacturers in the industry. Niftylift would like to thank and congratulate all those involved in the development and production of the HR21 4×4. To bring a product like this to market requires the collaboration of dozens of dedicated people, throughout the business, and this award highlights what can be achieved when talented individuals work together as a team. This recent success further demonstrates Niftylift’s position as an industry-leader in terms of innovation and performance, something of which Niftylift feels very proud.